I like traveling by train. That’s to say, not during rush hour. I recently visited the Boymans Museum in Rotterdam and traveling by train to the centre of the city is the most convenient way to get to the Boymans Museum. 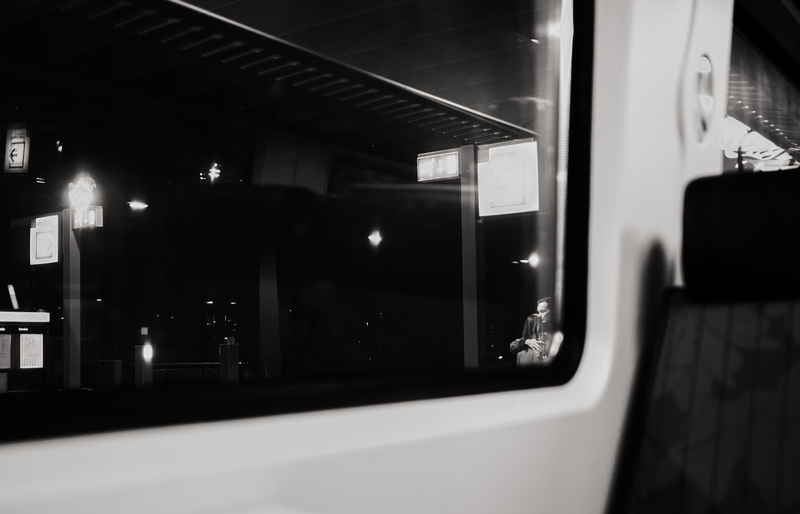 As I was waiting for my train to leave the Central Station, I was looking through the dirty window of the compartment (kind of drifting away). My eyes caught this couple. She was taking the same train and had to say goodbye to her boyfriend. It was a wonderful, heartwarming but foremost a cinema-graphic scene. I took some pictures right away; one in colour and this one. This one is a bit more dramatic and therefore better in black and white. Click on the photo to enlarge.